Roy Lichtenstein Painting: If people don't get the reference, they'll at least understand you're a comic character of some nature. This is mostly makeup; all you need for clothes is something vaguely retro. Powder your face as pale as possible. Use an opaque black pencil to outline your features and thicken your brows. Fill the empty space with red dots so you look peachy from a distance. 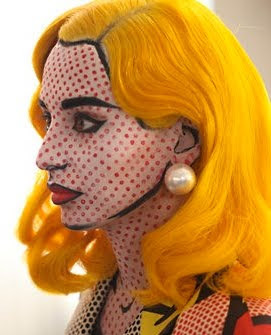 Makeup88 has a video tutorial on how to do a different Lichtenstein painting. American Tourist: Wear some old sneakers, a loud print shirt, fanny pack, camera (if you have an old camera it's even better), sunglasses, and a hat covered in themed pins (London, New York City, Disney World, etc). Static Cling: If you don't have much time, this one is pretty good. Just wear a normal skirt and blouse but pin them up in a couple spots by the hems. Make the "cling" very obvious. Using gel and hairspray, stick up sections of your hair. Ta-da! Bad Unicorn: One of our readers said that a recent love or loathe made her think of unicorns "in a bad way," and I haven't been able to get that idea out of my head. Of course, you could be a good unicorn, but where's the fun? You'll need a horn, and Doe Deere can tell you how to make one. Wear white. I used tights and a tutu for my look, but you can do anything. Throw on black and emo looks. For my look, I chose black jewelry and black makeup. Black glitter or a makeup scar on your face would be a nice touch.